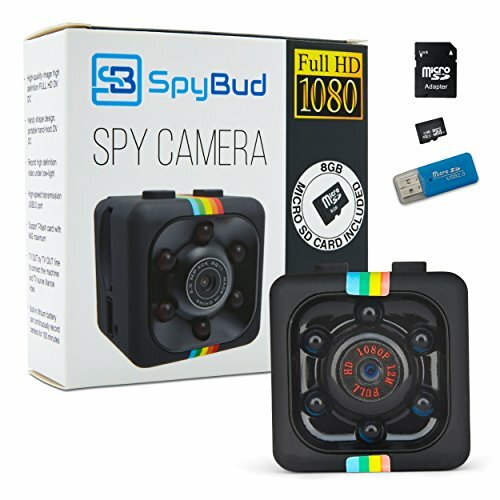 Spy Bud HD Hidden Mini Spy Camera SQ11 - Portable Motion Detection - Night Vision - For Drone, Car, Home & Office - With 8GB SD Card, memory Card Adapter & Card Reader by Spy Bud at DJC. MPN: SQ11. Hurry! Limited time offer. Offer valid only while supplies last. You don’t have eyes in the back of your head, but you can monitor your home, family or business with the Spy Bud HD Hidden Mini Spy Camera SQ11. You don’t have eyes in the back of your head, but you can monitor your home, family or business with the Spy Bud HD Hidden Mini Spy Camera SQ11. This versatile device can be used as an indoor/outdoor security camera, baby monitor, a dash cam, and even a drone-adaptable mini cam. With its high-quality features and small, compact size, this camera boasts tremendous flexibility. The 23-millimeter cube spy camera is a convenient, portable tool that can be discreetly placed in any location. Featuring HD 1920*1080P or 1080*720P video resolution at 30 frames per second and 12 million pixels (4032*3024) snapshot picture resolution, you can place it in your home or take it with you and leave it in a strategic location at the office. You can even sleep peacefully at night when you’re protected with Spy Bud. Outfitted with six infrared lights and enhanced night vision, the camera delivers a clear display – even when recording in dimly light areas and total darkness. These LED lights are invisible to the human eye and never flash. You don’t have to turn the camera on and keep it running all night long either. It’s equipped with Intelligent Motion Activation and only starts recording when movement is detected, preserving battery life and saving you the time of searching through endless hours of video. If you want to protect the people and belongings most dear to you, the Spy Bud Mini Spy Camera is a must-have. You can conveniently take pictures or videos without any attention, and keep an eye on things when you’re not around. Once fully charged, the built-in lithium battery supports up to 100 minutes of recording, and an 8GB SD card, memory card adapter and a card reader are all included for your convenience. 1080P FULL HD. The Spy Bud is made using high-quality optical glass multi-layer coating technology that can take the instant picture very well for clear and stable video. With a 1080P sensor, this camera captures over 12 million pixels (4032x3024), allowing you to see every detail without risk of detection. HIDDEN MINI SPY CAMERA. Featuring full HD, audio recording, this 23-millimeter cube spy camera is a convenient, portable tool for taking photos or videos anywhere. This small size can be discreetly placed anywhere, making it ideal for use as a home or office security camera, as well as a housekeeper/nanny cam. NIGHT VISION TECHNOLOGY. Full night vision captures every detail in low light conditions or total darkness. While infrared lights are invisible to the human eye and never flash, they record a clear display, even during the night. MOTION DETECTION. Supporting 1080P and 720P formats, this hidden camera can intelligently detect movement and will then start recording. It also includes a 360-degree rotating stent that allows the camera to circularly record videos. COMPLETE PACKAGE. The Spy Bud Hidden Camera comes complete with an 8GB SD card, memory card adapter and a card reader. Once fully charged, the built-in lithium battery supports up to 100 minutes of recording. If you have any questions about this product by Spy Bud, contact us by completing and submitting the form below. If you are looking for a specif part number, please include it with your message.